Combine black and refried beans in a large non-stick frying pan. Semi-mash black beans and add soy crumbles and taco seasoning with 1/4c water. Mix well and heat through (medium heat). Add corn and reduce temperature to simmer. In medium frypan melt 1 tbs of margarine. Cook tortillas one at a time, turning when tops begin to bubble and they begin to brown. spread 2-3 heaping spoonfuls of bean mixture onto tortilla. 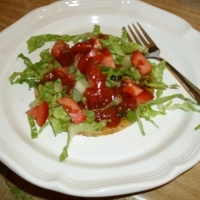 Add onion, tomato, lettuce over top along with taco sauce. Love tostadas:) Welcome to GR! Like mrsvegan's recipes? Never miss an upload!